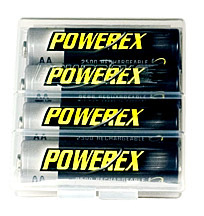 Powerex Batteries, available in AA & AAA sizes, use nickel metal hydride (Ni-MH) chemistry. Powerex Batteries have a very predictable discharge curve, so it is easy to predict performance. Powerex rechargable batteries work best when used with Powerex chargers, the best charger available for NiMH batteries. Click here to purchase Powerex batteries & chargers. Have you got other useful tips to share? Take a look at our blog! Be sure to check out buybattery.com for your Duracell wireless mic batteries.